Be they reports on the questions the special counsel plans to ask President Trump or more revelations about a payment made to Stormy Daniels, here are six of the biggest stories driving American politics this week. President Trump confirmed that he reimbursed his lawyer for a payment to Stormy Daniels. In an explosive contradiction on Thursday, President Trump confirmed that he had paid a monthly sum to his former lawyer, Michael D. Cohen, reimbursing a $130,000 payment made shortly before the 2016 presidential election to ensure a pornographic film actress did not come forward with allegations of an affair with Mr. Trump. Mr. Trump had previously told reporters that he had no knowledge of the payment made to the actress, Stephanie Clifford, who performs as Stormy Daniels. But Rudolph W. Giuliani, one of the latest additions to the president’s legal team, said on Fox News late Wednesday that he had documentation showing that Mr. Trump had personally repaid Mr. Cohen. Mr. Giuliani indicated that he came forward with the allegations to prove that no campaign finance laws had been violated. 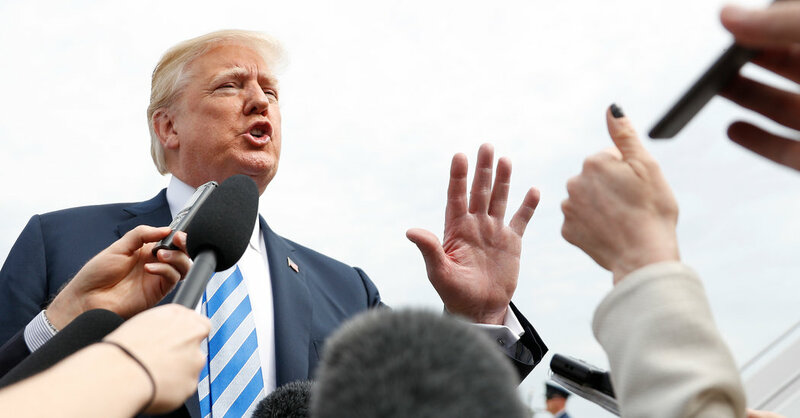 But his remarks, which continued in a series of interviews and television appearances on Thursday, may have exposed the president to legal and political danger. As President Trump revamped his legal team, tensions continued to rise between the Justice Department and Republicans in Congress. Mr. Trump hired on Wednesday Emmet T. Flood, the Washington lawyer who represented President Bill Clinton during his impeachment trial, to join his legal team. He replaces Ty Cobb, the White House lawyer who had pushed for Mr. Trump to cooperate with the special counsel’s inquiry. Mr. Cobb had argued that cooperating with the investigations would bring them to a swift conclusion, but the shake-up indicates that the president is bracing for a longer and more contentious battle on multiple legal fronts. But Mr. Trump chose on Wednesday to side with House Republicans over his own Justice Department in their push for department officials to turn over sensitive documents related to the special counsel, Robert S. Mueller III, his investigation and other politically charged cases. Mr. Mueller has at least four dozen questions that he wants to ask President Trump. The questions delve into Mr. Trump’s most combative Twitter posts and relationships with his staff and family. The open-ended questions are intended to help Mr. Mueller learn more about Mr. Trump’s ties to Russia and whether the president obstructed the initial inquiry. The questions chiefly ask about the circumstances surrounding Mr. Trump’s decisions to fire his first national security adviser and the F.B.I. director, a 2016 meeting at Trump Tower between his campaign officials and Russians claiming to have dirt on Hillary Clinton and his relationship with Attorney General Jeff Sessions. But the questions also touch upon the president’s businesses, including what happened during his 2013 trip to Moscow for the Miss Universe pageant and any discussions with his longtime personal lawyer, Michael D. Cohen, about a Moscow real estate deal. Amid nuclear diplomacy on two fronts, Mr. Trump asked the Pentagon to draw up plans for withdrawing American troops from South Korea. Mr. Trump is said to have ordered the Pentagon to prepare plans to withdraw all American troops from the Korean Peninsula, just weeks before his landmark summit meeting with Kim Jong-un, the leader of North Korea. The decision was unnerving for many in northeast Asia who are concerned about China’s growing military prowess and skeptical about Mr. Kim’s intentions. President Moon Jae-in of South Korea, whose office denied reports that the White House was considering removing troops from his country, also endorsed Mr. Trump this week for a Nobel Peace Prize, citing his involvement in coordinating talks between the two Koreas. Mr. Trump fanned anticipation of his meeting with Mr. Kim by pushing for it to be held in the Demilitarized Zone, the strip of land that divides the North and South. The Trump administration also embraced on Tuesday Israel’s claims that Iran had entered its nuclear deal under false pretenses. European allies said the disclosures that Prime Minister Benjamin Netanhayu made in a dramatic presentation on Monday actually reinforced the case for the 2015 deal. The Trump administration said on Monday that it would delay a decision on imposing steel and aluminum tariffs on the European Union for 30 days as it sought more concessions from trading partners. Officials are wary of retaliation on American products, and the delay gives trade officials the ability to focus on China in a separate trade battle. Treasury Secretary Steven Mnuchin and other trade officials visited China this week for trade negotiations, bringing with them new demands for Chinese concessions. But with internal divisions on the American negotiating team and bureaucratic reshuffling among the Chinese policymakers, the talks ended after two days without a deal or even a date to resume negotiations. One of the president’s former doctors said that Mr. Trump had drafted a letter on his health, and another won’t return to his old job. Other Trump appointees also faced headwinds. Mr. Trump’s former personal doctor, Dr. Harold N. Bornstein, said Trump aides took all of his medical files related to Mr. Trump in February 2017 soon after he told The New York Times that Mr. Trump took a drug to promote hair growth. Dr. Bornstein had also written a letter in December 2015 saying that Mr. Trump would be “the healthiest individual ever elected to the presidency,” but told CNN that Mr. Trump had dictated the contents of that letter. Dr. Ronny L. Jackson, Mr. Trump’s embattled and unsuccessful pick to lead the Veterans Affairs Department, is no longer his personal physician, but will remain in the White House Medical Office. At the Environmental Protection Agency, Scott Pruitt continued to face allegations about his coziness with lobbyists, including reports that he shared a house with a lobbyist in Oklahoma. Mr. Pruitt also allowed a lobbyist friend to play an unusually influential role in orchestrating a December trip to Morocco. The country hired the lobbyist shortly after.